I’ve finally started reading The New Spanish Table after it sat in my stack of unread cookbooks for almost a year. I’m only about 50 pages into it, but I can tell that it’s going to be a delight to read. Already, I’ve learned about the different regions of Spain, regional cuisine specialties, and a little history of each area. The first chapter of recipes is Tapas, and each item is introduced with some information about where it originated and variations on how it might be prepared. As usual, I wanted to make each and every item as I began this chapter, and this time I almost did. I chose several dishes including the first two in a row and spent an evening imagining I was in Seville on a tapeo that happened to take place entirely in one establishment (my house) rather than several. For today, I’m showing the first three tapas I prepared, and I’ll continue the story in a second post. Tangerine-marinated olives, Sevillian marinated carrots, and smoky fried almonds are up first. I wasn’t able to locate a tangerine for the olives, so I used an orange instead. Cracked green olives were marinated with orange zest and juice, lots of crushed garlic, lemon slices, sherry vinegar, olive oil, bay leaves, a crumbled dried chile, and a pinch of ground cumin. To prepare the carrots, they were peeled but left whole and cooked in boiling water in a large pot just until crisp-tender. The marinade was made by combining garlic, cumin seeds, dried oregano, red pepper flakes, fresh parsley, salt, and olive oil in a food processor and pulsing to a fine paste. Lemon juice was then added to the mixture. The carrots were cut into quarter inch or half inch pieces, tossed with the marinade, and left in the refrigerator overnight. The almonds were very simple to prepare. Marcona almonds were suggested, and that’s what I used, but blanched almonds would have been fine too. The almonds were fried in olive oil until golden and then were transferred to a paper towel lined tray to drain before being placed in a paper bag. Salt and smoked Spanish paprika were placed in the bag with the almonds, and the bag was shaken to distribute the seasonings. The great thing about a tapas party is that a lot of the preparation can be done a day or more in advance. However, the almonds are at their best served warm, but they could be re-heated in the oven right before serving. These were three very simple items, but the flavors were addictive. I know I have a good snack in front of me when I'm incapable of controlling my hand repeatedly reaching for the serving dish. 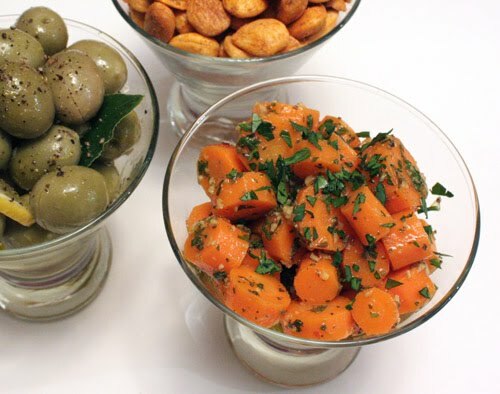 The citrus and garlic combination in the olives was a winner, and the marinated carrots will make you wonder why bars ever offered pretzels as snacks. And, warm, smoky, paprika-scented Marcona almonds don’t even require a flavor description. Pour me another glass of Garnacha, and let me continue to pretend I’m in Spain. Wonderful Lisa! I loved all these snacks when we traveled through Spain on our honeymoon. I was a little worried about being vegetarian there, but between the tapas, tortilla, and gazpacho, I ate incredibly well. Each of these tapas looks great! I especially like the Marcona almonds! I love Tapas. I spent a lot of time in Spain and it is such a wonderful way to eat. Marvelous Lisa! I love tapas! Lovely tapas, especially the olives. Marinated olives are the best! Haven't done tangerine juice though, so that's a new thing to try. Mmmhhh, they look delicious! I love fingerfood! I just love tapas. We use it quite often also when we have guests coming over as it is perfect to prepare ahead! Tapas are wonderful when having a social, informal party for friends. 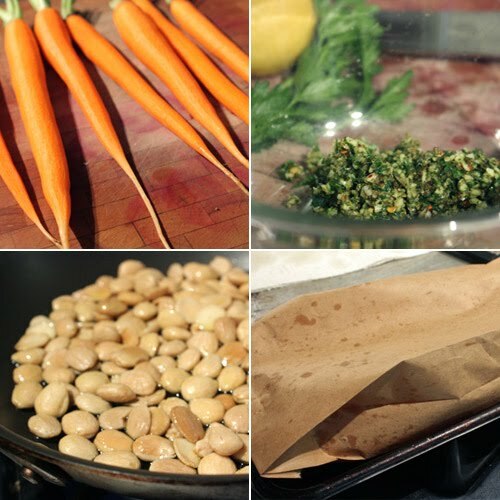 that marinade for the carrots sounds awesome, and i love the idea of fried nuts. i was gonna say that tapas would never work for me, but i could see how these would be awesome. 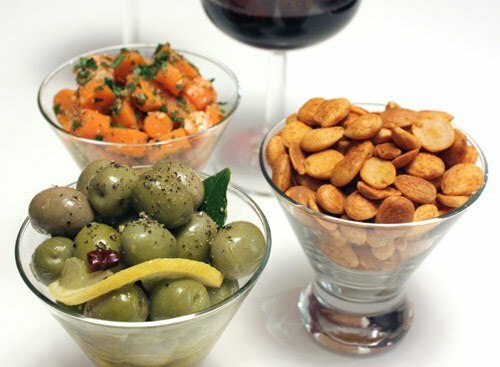 Love, love, love tapas! Nothing more fun than little "picky"-type finger food - yum! I understand the part about not being capable of controlling the hand repeatedly reaching for the serving bowl. Look at how lovely these snacks are. 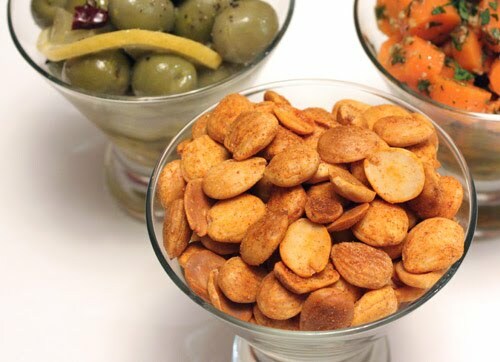 I love marcona almonds and of course, I love tapas. I'm dying to go to Spain. Looking forward to more tapas. tapas sound great!! great job lisa! Tapas are so much fun! Loved the assortment we had in Spain. I tried to reproduce them when I got home...didn't do too badly either. Can't wait to see what others you come up with. I love make "Tapas". I have many receipes on my blog. Its also are named "Pintxos". I enjoy tapas when somebody does it for me...hahahahhahah....cos I need to do too many things at one time and my kitchen is too small! I skipped breakfast this morning because things were very busy and now that I opened your blog and looked at these pictures I am SO HUNGRY! These look so wonderful! Yum yum yum perfect! Now I'm hungry. Tapas and a glass of white. I haven't had tapas before. Yours look fabulous! I have a tapas cookbook that I haven't used yet - I'm inspired now! These all look delicious! I love everything here. The olives are like I have never heard before. I have to make the carrots and the almonds soon. I so need to make some Spanish cuisine after seeing your posts. You've got me craving some good nibblies that would go with a nice glass of red! Love the olives and almonds! There is a well-regarded tapas restaurant in Minneapolis that we've been meaning to hit. I can't think of anything more enjoyable that a lingering meal of small bites!